Moore's Law: CO2 Good; Climate Change Bunk; Greens Follow Religious Fundamentalism | Watts Up With That? Moore goes on to list some key facts about “climate change” which are ignored by true believers. 1. The concentration of CO2 in the global atmosphere is lower today, even including human emissions, than it has been during most of the existence of life on Earth. 2. The global climate has been much warmer than it is today during most of the existence of life on Earth. Today we are in an interglacial period of the Pleistocene Ice Age that began 2.5 million years ago and has not ended. It is a real pity that so much intellectual effort is being expended – (along with taxpayers real cash) on the false god of CAGW. But without the efforts of intelligent argument from the likes of Patrick Moore we would all be victims of this monstrous lie, thanks. Greenprice is not anti capitalist, for themselves, its just an evil system when they do not have the money of the marks who give. Standard snow job, whatever the client needs to hear, to part them from their property. I predict one of the finest aspects of the coming /continuing collapse of the Cult of Calamitous Climate (A certifiable Death Cult), will be the rising anger and open hostility toward the organizations who orchestrated the spread of this mass hysteria over plant food. For the damage is legion and now writ large in our economies, the stagnation in lifting the worlds poor out of poverty, the deliberate push to maintain poverty or even expand its reach. All the pious chatter of the faithful has been used to produce action/regulations that are truly evil in action. Of course climate change is bunkum, you can not heat water through its surface by convection. Surface tension blocks the heat transfer. It is not possible to add additional heat to that provided by the sun’s rays. And you cannot boil the ocean away either. The fresh breeze of sanity…thanks, Dr. Moore. In the early 1800’s no one knew about ice ages. As older scientists passed on the new discoveries took root and were accepted as fact. For over a hundred years we have known we are in the grip of a brutal ice age, thankfully, in a warm period thereof. I suggest this is not common knowledge among the populous. Maybe it will take a trip to Greenland or Antarctica to make the ice age real. It is there to go see which I did many years ago. I can think of nothing good about continental ice sheets. I don’t like the way the word, fundamentalism, is often and disparagingly bandied about. It’s often equated with blind faith, meaning belief without any evidence. And most religious people are not like that. And one person’s fundamentalism is another persons deep and sustained commitment to principle. Humans are built to be religious, to organize their lives around some primary principle – natural theology builds on this fact of human existence. It’s only when we organize our lives around self-blinding death cults and other sorts of idiocies – like CAGW – do we get into real trouble. in parallel you can read judith curry’s post..”can we trust climate model?”.. I recently read a similar commentary from David Bellamy (UK botanist, climate sceptic) who make an interesting point. Environmentalists (at least in the UK) used to campaign against roads because of the (genuine) damage done to wildlife by cars and trucks. Now all that seems to be forgotten, nobody cares anymore about cars, except for the harmless gases that come out of the exhaust. MikeUK is right. “Climate Change” is the mother of all excuses for politicians, power-merchants, egotists and various vested interests to do anything or nothing, as it suits them. Who needs terrorism, when you have climate terror as your bogyman?! Michael Babbitt. I think we might have to agree to disagree about evidence for any religious belief and even if it is true that humans are built to “organize their lives around some primary principle”, that doesn’t mean that the principle has to be religious. The term “fundamentalist” is rarely, if ever, popularly applied to even the most devout believer in a religious belief, however apparently bizarre, if they aren’t harming anyone else and are reasonably tolerant of people with different points of view.. This calls for a parable. A salesman knocks on your door, and informs you that you need new windows for your home. You politely decline, but day by day, he keeps coming to your house and telling you how worthless your windows are. He points out that they are “dirty.” But your windows are just fine – they perform beautifully, they are paid for, and they are easy for you to care for and use. So, you tell him resolutely to leave. This same salesman then leaves and goes to your city council and mayor, and they all determine that the windows in peoples’ homes are “dirty.” While you are working, they pass a law banning the use of your windows, and requiring brand new triple pane gold plated lightning repelling doped glass windows, which accelerate ions into the home for improved energy efficiency. They hire window smashers and claim in flyers they have improved employment in your town, and then promptly bust out your windows. They congratulate themselves at dinner parties that they have increased the economic activity by selling so many windows. No one is surprised to learn that only a few select companies make the kind of windows they have mandated. Anti-coal and anti-fossil fuel activists will cost you money, no matter how they go about it. I simply cannot afford paying for all new nuclear plants when the hydro and coal plants are working beautifully and are paid for. Please read Bastiat. Emperor Obama and his band of green sycophants are bent on “saving” us from our fossil-fuel folly, whether we like it or not. Men and women of good character have but one choice, vote. A person who believes in a proposition without evidence will not participate in a rational discussion of the evidence. They usually display a personal dislike of any who disagree with their position and resort to name calling instead of presenting a rational defense of their belief. I suggest such people be referred to as irrationalists instead of fundamentalists. Hydrocarbons in Fossil Fuels in the family most consumed when oxidized produce H2O 2:1 over CO2 and/or CO. H2O vapor doubles CO2 in specific heat capacity, however to the CAGW fanatics CO2 somehow at 400 ppm of atmosphere content is dangerous to our survival. The Westborough Baptist Church would be a notable exception. Lest we forget, almost all politicians attend church services on a regular basis with regular public profession thereof. Much good does it do them for their “principles” not to mention the irony therein? …willfully ignoring my former experimental falsification of his preposterously bizarre claim, one that helps tarnish the reputation of skepticism, probably willfully. He is very correct. I have seen environmental efforts that had measurable effects, risks and outcomes, get shut down and money diverted for….kindergarden color books, etc. Remember the Rio Bravo encephalitic babies? The cultists had us running around testing water because “its the evil corporistas dumping hazmat in the water.” Meanwhile, babies kept dying…because Hispanic mothers were not getting enough folic acid. but no one was listening to fact and science….let babies keep dying and chase down propaganda fodder. Time after time, I am seeing this happen over and over. Many of us who used to work at EPA and glad we are out…especially those who spent 30 years trying to get mercury down and those of us who worked superfund sites. Further to MikeUK’s David Bellamy quote, there was even, back when Patrick Moore was founding it, a perfectly good and valid purpose for Greenpeace. While they were finding and showing us streams filled with foaming, bright orange grot, or landscapes gloss black with oil from here to the horizon, there was clearly plenty needing attention. No problems with supporting that sort of stuff. Good work. Back then, of course, they acted to check the most offensive of pollution emitted by corporations, with genuine public support. Now, they’ve established a comfortable working relationship with the corporations, and in exchange for generous support from them seem mainly to be helping to work out new ways to “tax” the public’s ordinary life – along with too many other zealots. (Thanks to John Brignell for an excellent, if depressing, read.) Russia and India have the right idea on the modern Greenpeace and other NGOs, and should be widely followed. Agree too about “fundamentalism / ist” having been given a Newspeak meaning which spoils its proper use. I’ve known plenty of people with firm religious views, and all would cheerfully argue you to death rather than using any other method, no matter which particular “fundament” they represent. Sadly, even being aware of the “switch” doesn’t prevent the crazed nutter from coming to mind when you hear the word. The term, or anyway a term, that is used in political science for what you are describing is “extremism,” or an “extremist mentality.” It afflicts different people in varying degrees, and it afflicts the same people in varying degrees at different times. It is equivalent to the “lunatic fringe”–and some movements are fringier than others. Jeff, your are correct to use the word “exception”. Not all who claim to be something actually are, regardless of whether they claim to be fundamentalists (Mathew 7:18-23) or believers of CAGW. Leaders of various groups of people, whether religious or political, sometimes profess a particular belief for the purpose of personal financial benefit. Since the evidence for CAGW is so meager (non-existent? ), it seems that leaders of the CAGW movement are primarily motivated by personal gain, coupled with extreme political ideology, and some politicians have adopted the cause for the same reasons. However, just as not all scientists and politicians should be linked with CAGW proponents, neither should irrationalists (see my post at 10:55 am) be linked with Christian fundamentalists. The claim that Christian fundamentalists are blind believers is on a par with the claim by CAGW proponents that skeptics of CAGW are (the D word). This on top of us finding out Russia has infiltrated and is probably funding the anti-fracking movement. Well, Russia doesn’t want the fracking technology to expand of course. I saw a news report this morning about an environmental activist/protester who was getting paid to protest against Barrick Gold by Australian gold companies (fronted by a “green” fund). The religious fundamentalists/activists are getting funded in addition to being fundy mental persons (sometimes by the business competition). Its crazy as well as mental that we allow this to go on. Frankly, I’ve always felt that casting greens as religious fundamentalists is unfair to actual religious fundamentalists. Is H2O a pollutant? It’s a green house gas and I boiled a pot of water today. Marxism has a problem. People keep trying to escape from it. The solution is simple. It must be world-wide! At least it’ll foster space colonization. I assume it is the “Ice Age” and not the current “interglacial period” that began 2.5 million years ago. There are two ways to read that sentence. In reference to your video demonstrating heating of water by application of hot air: using such a small quantity of water in that tall bowl allows the possibility that the hot air directly heated the bowl, which then heated the water by conduction. Something seems to be amiss as the temperature gain for the first period of heating was 6 degrees over 47 seconds while the second period of heating gained 8 degrees over 29 seconds. The difference in heating rates suggests loss of water due to evaporation (a result of the flow of air upon the water surface) during the experiment exposed more of the bowl to the hot air, resulting in more heat being transferred to the water via the hotter bowl. Had the water been solely heated by hot air contact with the water surface, the rate of heat gain by the water during the 2nd test would have been lower due to decreasing surface area as the water level dropped within the bowl, or would at least have varied in accordance with the change in surface area to volume ratio of the water. That parameter would have to be monitored in order to properly evaluate the test. Using a cylinder made of styrofoam or other nonconducting material filled to the rim would reduce the possibility of heat transfer from container to water, and simplify calculating surface to volume ratios. Run sequential tests, compare heating/cooling rates compared with evaporation, and make sure the thermometer is not warmed by the hot air stream. Ban spoke to a vast audience that included some 30 heads of government and representatives of more than 100 nations, about two-thirds of the world’s countries. The destiny of billions of poor people and the state of the planet depends on their work, Ban told the group. Dignitaries at the event include the presidents of Venezuela, Ecuador, Cuba and host nation Bolivia. China, which is not a G77 member, is participating in the summit, partly in a nod to its expanding trade ties in Latin America, although President Xi Jinping will not attend. Leaders at the summit are pressing a “fight for fair and sustainable economic growth, and for a new world economic order,” said Venezuelan President Nicolas Maduro. No source for your quoted material and no mention of Baby Boomers in it. ‘Nothing as in zip, zero, nada, zilch to support your hysterical slurs against an entire generation. But, in the final analysis, I try to have empathy with you, and seek understanding of whatever personal trauma you must have endured at the hands of my generation to inspire such impassioned contempt. 1. A form of a religion, especially Islam or Protestant Christianity, that upholds belief in the strict, literal interpretation of scripture. 2. Strict adherence to the basic principles of any subject or discipline. Fundamentalism is an attitude which is ascribed to religious people and is used in this WUWT post as a derogatory term. What I am attempting to introduce into the equation is that we who take our sacred texts very seriously do not own a monopoly on fundamentalism; instead, there is a very real possibility that the Baby Boomer generation can be considered some of the most entrenched fundamentalists of all. Some examples of subjects which Boomer Fundamentalism encompasses are: environmental regulations to the point of criminalization of normal and beneficial economic and social activity; recreational drug use, organic farming, government expansion and debt, and population control, to name a few. The Baby Boomers are in the highest positions in academia, politics, media, and entertainment right now and their fundamentalism has come to its final fruition in efforts to harmonize all economies in a world government under the environmental rubrick of “sustainable” development. Although it is not possible to make the full case here, I think this is The Baby Boomer Project. And now look what company Boomer Fundamentalists have landed themselves with in the G77+China Sustainability Summit. Trashy dictators and foreign interests. But Steve P, thank you for your rap on the hand, I did deserve it, because the subject is too large, subliminal, and unacknowledged to try to mention it in a small comment. We live in a small town and there are now two headshops right on the main avenue. A dork dressed like a clown or a joint holds a sign on the corner, one block from my church, advertising the head shop. There are drinks and candies which contain MJ sold in the local covenience stores as sports drinks. The local high school, which once was great, now is flooded with heroine use. There are heroine users living under bridges and making camps in our woods. They leave mattresses, tents, and needles behind for every one else to clean up. Kids are dying of overdoses. My son was going to enter the reading contest with the local library and one of the prizes was a pen shaped like a hypodermic needle. I went back to visit the hippy town I grew up in and they had population control messages on every business window in the town. Something about two children only. This is the latest trauma I have suffered under the Boomer Generation. Thank you for trying to understand. So Boomers are always getting their way because if it feels good they do it, and I always have had to pay for it my entire life. Agree the problem with Marxism is that it so far, nationally, has been experienced less developed and poorer than more mixed kapitalistic nations. The great Marxist solution? Hey let’s use environmentalism and climate fears to create UNEP global government, with the climate treaty, and rid Earth for kapitalism so no one will notice that we are not fre, do not develop and are poor? The other night I made a jacket potato in the microwave. It took about 9 mins. The plate was so hot that I could not take it out of the micro wave without oven gloves. A number of questions arise from your experiment. 1. What was the temperature of the bowl (both above and below the water line) before switching on the heat gun? 2. What was the temperature of the bowl (both above and below the water line) after using the heat gun? 3 What was the temperature of the hot air from the heat gun, and its velocity? Your experiment is not comparable with conditions seen on planet Earth. The air temperature over water is driven by the temperature of the water below. It is about the same temperature as the water itself. Notably it is not 100 (or more) degrees C warmer than the sea below. Incidentally, I have studied many hundreds of thousands, possibly millions of entries in ship’s logs where water temperature, air temperature and sea state are recorded every 4 hours, so I am well acquainted with ocean conditions and prevailing air temperatures. When it is rough and windy, at least as often as not, one gets cold winds as opposed to warm winds (the cold winds displacing upwards the lighter and warmer air). So presumably in these conditions, you would expect ocean cooling thereby cancelling out (equalising) any warming from periods when there wwere warm winds. I am of the opinion that you need to re work your experiment by making an insulated container say a polystyrene box. make one half water proof and fill it with water at known temperature. In the other half fill with air say 2 degC warmer than the water. Then check to see how the temperature of the water reacts. Repeat but gently rocking the box to replicate wave action. I have thought for a long time that the ‘environmental movement’ has been hijacked by the climate change alarmists, much to its detriment. When I point this out to others I often get stared at blankly or receive replies which indicate they put climate change as the root of all environmental concerns. Further to my last post regaring Nik’s experiment. What I suspect is being observed is that the bowl above the water line is becoming heated as a result iof the heat applied from the heat gun. The heat of the bowl is then spread by conduction around the entirity of the bowl itself such that the bowl below the water line is now warmer than when the experiment began and is heating the water by conduction (largely from bottom upwards). Today’s greens are yesterdays reds. Greenpeace is trying to stop fracking in the UK, Greenpeace paid by Russia to do this. What I am attempting to introduce into the equation is that we who take our sacred texts very seriously do not own a monopoly on fundamentalism; instead, there is a very real possibility that the Baby Boomer generation can be considered some of the most entrenched fundamentalists of all. Some examples of subjects which Boomer Fundamentalism encompasses are: environmental regulations to the point of criminalization of normal and beneficial economic and social activity; recreational drug use, organic farming, government expansion and debt, and population control, to name a few. Ah so. Fundamentalism is acceptable in the hands of those who take their sacred texts very seriously, but dangerous when connected, even arbitrarily, to Baby Boomers? ‘Don’t quite follow you there, but again, you offer no support for your assertions, which – to anyone with even the slightest knowledge of history – are laughable. Population control is a Baby Boomer invention? Join me now as as a company of merry pranksters travels back in time to found the Eugenics movement, which will include Arrhenius himself. I think you’re just jealous that many Baby Boomers are now retiring, with some in reasonably good health because obesity has never been a problem with my generation.. True, tobacco and alcohol have already taken many, but as far as I know, no one has ever died from pot, although many have suffered from its persecution, often led by religious zealots like yourself, cherishing your sacred texts, which I consider a load of hooey. It may surprise you to learn that the so-called hippie movement did not spring up spontaneously within my generation, but rather was led by a number of scraggly pied pipers, including more than a few with rather curious connections, who had arrived on the scene just as the anti-war movement was beginning to gain momentum, and who were successful in discrediting and scattering its forces. It was only when the ranks of the anti-war movement were swelled with, and eventually led by increasing numbers of returning Viet Nam vets, hippies kicked aside, that the anti-war movement regained the moral high ground. Is your point that CAGW proponents have no evidence to support their belief, and thereby earn the label “fundamentalists” because “holding a belief without evidence” is what fundamentalists do? I agree there should be a word or phrase that describes any who hold to a scientific proposition that has been shown to be unsupported by scientific evidence. “Irrational” seems apt as a label for their belief, and I previously proposed “irrationalist” for the nasty variety that employ insults instead of scientific evidence to “support” their belief. I do not agree that “fundamentalist” is a good choice for this use because this word has been hijacked the same way “skeptic” has. Skeptics do not deny the scientific evidence, nor do Christian fundamentalists hold a belief without evidence. There is a distinction between scientific propositions that require scientific proof and, e.g. historical propositions that do not require scientific proof. There is no scientific proof that George Washington was the 1st president of the U.S. Are all who believe he was, exhibiting blind faith? Or are written accounts sufficient proof? The word “fundamentalism” originally meant belief that the Bible is a true historical account. As a footnote, this reply is on point because religious fundamentalism is a key point in the post and this thread. RMB’s claim is incorrect, it is possible to heat water through the skin evaporation layer, it is just not very effective. “surface tension” is a mis-direction. However, the criticisms of your demonstration by Steve Reddish and Richard Verney are valid. This experiment is best run in a square tub filled to the brim, with the hot air source positioned so as not to cause splashing or heating of the plastic tub. The experiment can then be re-run with the hot air directed at the side of the tub to demonstrate the dramatic difference in heating. I understand that many sceptics are cautious about challenging the “basic physics” of the “settled science” for fear of looking foolish. All it takes to exploit this is a few people who are clearly wrong posting comments that sound similar to those who challenge the “DWLWIR keeping the oceans 33C warmer than theoretical blackbody” meme, and the fearful can be easily steered away from examining the foundation of sand underlying the whole CAGW thing. Perhaps it’s time to ask the question as to why so many “false flag” efforts are concentrated in the one area? Why are climastrologists suddenly so desperate to abandon SSTs as a metric for warming? I have run a number of experiments into the issue of DWLWIR slowing the cooling rate of water that is free to evaporatively cool. The clear answer is that it is entirely ineffective. DWLWIR is not what is keeping the oceans 33C above their theoretical blackbody temperature. – placing these experiments in full sun for a few hours will give a clear demonstration as to the difference between “near blackbody” and “selective surface”. Given 1 bar pressure, the net effect of the atmosphere over the oceans is cooling of the oceans. The atmosphere in turn has only one effective cooling mechanism – radiative gases. The oceans cover 71% of the planets surface. Have a think about what that means for the entire idea of a net global radiative GHE. It’s not a little bit wrong. It’s completely and utterly wrong. Note – nothing I am presenting here challenges known radiative physics in any way shape or form. I am simply challenging the mis-application of standard S-B equations to moving fluids, transparent materials and materials that cool via evaporation. Patrick Moore is absolutely right when he says that climate changes have no scientific basis to today’s claims that the changes are based on the consequences of human action and some kind of models that can spruce up the computers at will. The computer made films that were “revived” the dinosaurs. It is rare that there is someone who uses his awareness when he wants to know the true causes of an event. All run to their computer to do such people without individual consciousness believe his “pet” more than all the things of which they are incurred but not yet aware of who they are and how else can create anything. The biggest fallacy to argue that the climate is changing, depending on what people are doing. There are many logical and influential factor that causes climate change and all the phenomena of the sun. 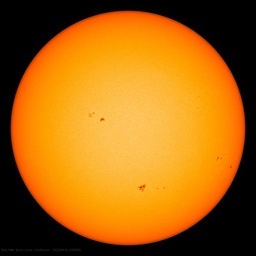 Sunspot cycle of about 11.2 years (the average), the main indicator of change, but not the cause. There are a lot of cycles and sub-cycles generated by the interaction of celestial bodies in the solar system. The solution to this issue is the biggest challenge of science at all times. Why then there is no seriousness to invite those that offer a logical solution. I know from my previous offer, that many of you wonder how a stranger like me can give such explanations. Because I have a true indication of the solution of the enigma, and many do not believe that it is a matter of today’s level of consciousness of the majority, who only want to earn money on deception. This is politics, and even modern science. To check all who read this, I ask: Does anyone on the planet knows that prove the true cause of the spin of the planet. I know one, and it seems that I am. Do you want to learn, provide a fair correspondence. two correct answers are possible. depending on the humidity and temperature difference between the air and water, a moving stream of air may cool or warm a body of water. using a heat gun with a temperature difference in the hundreds of degrees is not a realistic recreation of ocean conditions. conservation of angular momentum does seem far fetched as an explanation, given the highly improbable near integer resonance with orbital periods. why does a boat adrift on the ocean naturally align itself broadside to the waves? for the same reason the planets spin. it is the minimum energy configuration of the overall system. they be richer in the life giving gas. I should hope so. CO2 is the gift that keeps on giving. Wow, you guys are spending way too much time and effort refuting the surface tension loon troll. guesses, but organizations of well established fact. I’d call “Catastrophic Anthropological Global Warming” a hypothesis rather than a theory. RMB made a simple claim repeatedly over the years that you can’t heat a bucket of water with a heat gun. So I took a thermally insignificant thick paper bowl and the water in it heated exactly as any user of a hair drier would expect it to heat. You have atoms arranged in space and energy input. That spells heat and a thermometer shows this simple everyday influence of adding heat to a system of atoms. Skepticism has been sadly infiltrated by crackpots and thats my point. Either shun them or become them in the public eye. You could barely design a better crackpot bot than RMB if you wanted to politely deface the reputation of climate model skepticism. … Patrick Moore, a co-founder of Greenpeace, made particular mention of the fall of the Berlin Wall in this essay written in 1994 – see paragraph 2 below. I categorize extreme environmentalism as a cult. Their demands to save the earth are extreme and judgmental with a huge dose of punishment promised if everyone doesn’t agree with and implement their solutions. The movement might fade from view faster if not for many governments fueling their zeal with huge piles of money. The governments believe a huge cache of gold will be theirs through taxes, fees and regulations on the evil carbon rich “fossil fuels”. Everything is justified by claiming their policies and programs will save the earth. I would believe in whatever Greens spews if they act like they believe in it as well. @ Ferdberple your answer relating to the causes of the planets spin, has nothing to do with the actual causes of the proofs, when viewed on the basis of existing laws and logic. The difference is that the Greatest Generation fought these political and social movements in WWII, and also by proxy all over the world, but the hippies embraced them, utterly and coldly betraying both their parents and their children. Dr Patrick Moore is right, except for one thing… climate change (i.e. catastrophic man made global warming) is not a theory but a supposition (at best, an hypothesis). It has been propped up by flawed climate model projections and scenarios, cherry-picked data, and misleading information, and placed on a pedestal with the claim that it represents indisputable “gold-standard” science… and God help any real scientist who dares challenge this “gold-standard” science with valid scientific evidence.